I was trying to use the Plex Queue extension for chrome for a while but I was having some problems. Every time I tried to use it I got this error message: You need to sign in first. I tried reinstalling it and that didn’t work. Then I tried the Plex It bookmarklet but that also didn’t work. After some Googling I found out that the problem was with me disabling third party cookies in Chrome and Chromium. I didn’t want to enable third party cookies again just to use the Plex Queue extension. 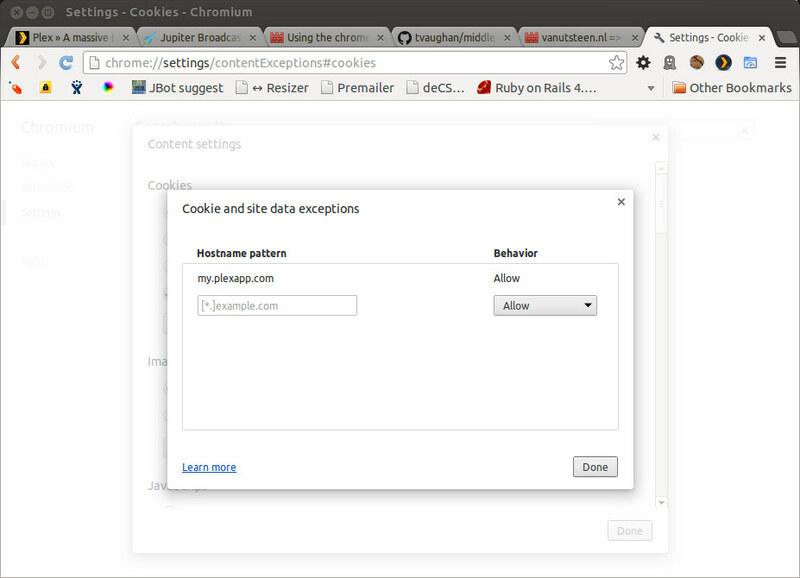 Luckily you can whitelist certain sites in Chromium (and Chrome) to allow third party cookies for a certain site. Then click Manage exceptions and add my.plexapp.com as a new hostname pattern. Then click done and voilá: the Chrome Plex Queue extension works!